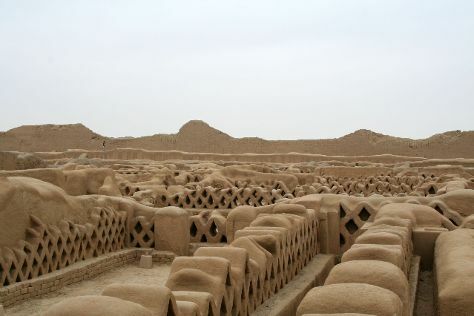 Visit Huaca Pucllana and Iglesia y Convento de San Francisco for their historical value. Satisfy your inner culture vulture at Miraflores and Larco Museum. There's lots more to do: take in the architecture and atmosphere at Cathedral of Lima, admire the local landmark of Plaza de Armas (Plaza Mayor), take a stroll through Barranco, and take in the views from Bridge of Sighs. To find more things to do, other places to visit, reviews, and more tourist information, read Lima holiday planner. London, UK to Lima is an approximately 21-hour flight. The time zone changes from Greenwich Mean Time to Peru Time, which is usually a -5 hour difference. Prepare for somewhat warmer weather when traveling from London in May: high temperatures in Lima hover around 26°C and lows are around 20°C. 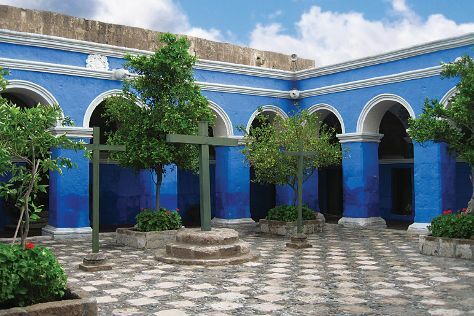 Wrap up your sightseeing on the 9th (Tue) to allow time to travel to Trujillo. Start off your visit on the 9th (Tue): steep yourself in history at Huaca del Sol y la Luna, explore the ancient world of Museo Huacas de Moche, then contemplate the long history of Casa Urquiaga, and finally delve into the distant past at Chan Chan. For photos, more things to do, reviews, and more tourist information, refer to the Trujillo trip itinerary builder. You can fly from Lima to Trujillo in 2 hours. Alternatively, you can take a bus; or drive. In May, daily temperatures in Trujillo can reach 26°C, while at night they dip to 21°C. Cap off your sightseeing on the 10th (Wed) early enough to travel to Arequipa. Your inner history buff will appreciate Historic Centre of Arequipa and Yanahuara. Monasterio de Santa Catalina and Monasterio de la Recoleta are good opportunities to explore the local culture. Next up on the itinerary: admire the landmark architecture of Plaza de Armas, take in the architecture and atmosphere at Iglesia de Yanahuara ( San Juan Bautista), contemplate the geological forces at El Misti, and examine the collection at Cathedral of Arequipa Museum. To see ratings, other places to visit, and more tourist information, refer to the Arequipa tour planner. Traveling by flight from Trujillo to Arequipa takes 4.5 hours. Alternatively, you can drive; or take a bus. Expect little chillier evenings in Arequipa when traveling from Trujillo in May, with lows around 10°C. Wrap up your sightseeing on the 13th (Sat) to allow time to travel to Cusco. Popular historic sites such as Sacsayhuaman and Centro Historico De Cusco are in your itinerary. Satisfy your inner culture vulture at Plaza de Armas and Sacred Valley of the Incas. Venture out of the city with trips to Ollantaytambo (Pinkuylluna Mountain Granaries & Archaeological Park Ollantaytambo). Next up on the itinerary: appreciate the extensive heritage of San Blas, examine the collection at Pre-Columbian Art Museum, explore the ancient world of Choquequirao, and pause for some serene contemplation at Convento de Santo Domingo. For maps, where to stay, more things to do, and more tourist information, read our Cusco trip generator. Getting from Arequipa to Cusco by flight takes about 1.5 hours. Other options: drive; or take a bus. Traveling from Arequipa in May, expect a bit cooler with lows of 4°C in Cusco. Wrap up your sightseeing on the 18th (Thu) early enough to travel to Machu Picchu. Start off your visit on the 18th (Thu): explore the ancient world of Machu Picchu and then look for gifts at Artesanias. Here are some ideas for day two: look for gifts at Machu Picchu market adjacent to the train station, then explore the ancient world of Winawayna, then identify plant and animal life at Jardin Botanico en Machu Pichu, and finally explore the ancient world of Machu Picchu Cusco Trek. To see where to stay, ratings, traveler tips, and other tourist information, read Machu Picchu holiday planner. Traveling by train from Cusco to Machu Picchu takes 4 hours. Alternatively, you can drive. Wrap up your sightseeing by early afternoon on the 20th (Sat) to allow enough time to travel back home.